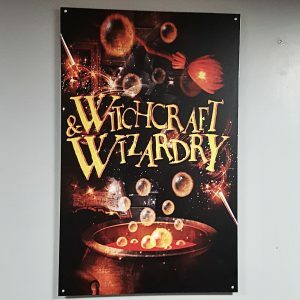 The fantastic Love Pop Ups London has invited me along on her team to play Escape London‘s Witchcraft & Wizardry room. After having done their Taken, Seven Seas, and The Cabin rooms already, I was really looking forward to trying this one! The Witchcraft and Wizardry room’s theme is very Hogwarts-esque. You and your team are students at a magical school and have been caught by an evil professor and must escape detention before he returns from his lunch break. With this fun theme to start with, the room is absolutely beautifully decorated with lots of magical items and so many small details to explore and find. We immediately set to task finding clues and solving puzzles, working our way through traditional as well as mechanical setups that were just so much fun to play with. There are some very creative devices and puzzles hidden in this gem of a room. All the little games and puzzles were logical and made a lot of sense, so we quickly progressed through this room, only getting stuck on one item that happened to be a replacement puzzle for an item that was broken the day before. This replacement puzzle hadn’t been tested yet and led to some confusion, but the game host took our feedback very well and said the confusing instructions will be corrected for future groups playing the room. Other than that small snag, everything in this escape room was very logical and solvable. There could be some a little more involved, complicated puzzles to make this room a bit more difficult, but for a mid-range difficulty room, this was just a ton of fun to play! 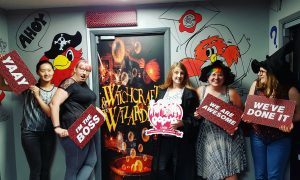 We managed to set a new record time with 38 minutes to escape, but newcomer teams will definitely get their hour’s worth of play out of this room. I definitely enjoyed the experience a lot and will be back to try the other rooms this company has on offer as every one I’ve tried so far was fantastic and a joy to work through. I’m rating this one five out of six rainbow sloths! Can’t wait to come back to try the other rooms!